12 Tallest Bridges In The World - Would You Dare Cross Them All? You are here: Home / Fun Stuff / 12 Tallest Bridges In The World – Would You Dare Cross Them All? Bridges are often designed to allow ships pass beneath them. This means that the roadway is already very high above the waterway, and has a long open span. 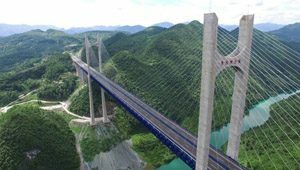 Would you cross a bridge that is over 800 feet / 240 meters tall?